We will be attending 'The Baking Industry Trade Show' in Melbourne between 4-6 June 2019. Save the date and come and visit us at Sites 39 to 45 - 54sqm's of space to showcase our equipment. We will be offering the latest in baking equipment with some new and exciting lines ready to wow you! International Bakery Equipment t/as All About Bakery Equipment is a long-established business that is specifically operated to cater for the baking and pizza industries. Our friendly staff members are from the industry and this helps in getting the right results for our customers. We have done it before so we know what works. Knowing what works allows I.B.E to engineer our machinery to be effective and long lasting. At All About Bakery Equipment we build long term relationships with our customers. IBE Equipment Equipment: "Engineered to work, built to last!" OUR COMMITTMENT: "At All About Bakery Equipment we build long term relationships with our customers. We are here for the long-haul. Our relationship with you begins with the first contact but continues on long after supply as our after sales service continues for the life of the equipment." 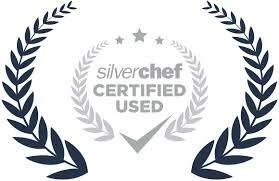 All our NEW and REFURBISHED equipment is fully SilverChef Certified!